Since my SIL Les tells me they're expecting a snowstorm in NYC this week, here's a video for you folks living in the cooler climes! Well, this is handy dandy too for us peeps living in the tropics, because flip flops happen to be a year round staple. 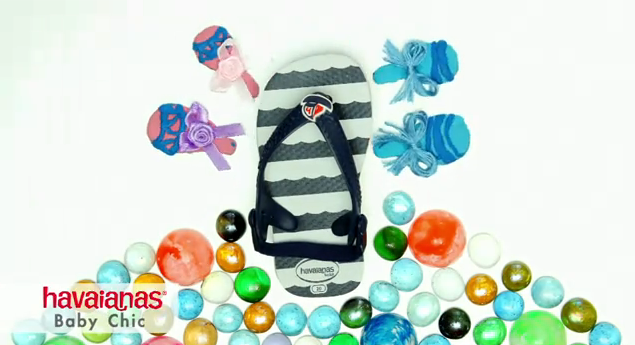 And hey, wouldn't you want to know what's new from Havaianas this year? Ooooh ooohh! Did you see this (1:20 in the video)? I just bought Berry a pair three weeks ago! Love this nautical little thing! When Berry lost half a pair of Havaianas some months back, I thought I was done buying fancy flipflops for her. Not until her feet can really hold on to her slippers, I said. But while browsing at All Flip Flops on Bonifacio High Street, I saw these and couldn't resist! Now, back to you guys who are freezing your asses off. I know it is hard to get into a summer state of mind. But all the more reason to get into that mood I think! Just turn on the heater at home, put on some island music, wear shorts & a Hawaiian shirt or wrap yourself with a pareo, and mix yourself a pina colada (although personally, I prefer a mojito). Et voila, summer is at it's peak in your living room while gusty winds and freezing temperatures are raging outside! Well, if it's any consolation, I am missing all the layering you are finding to be a chore now. I want to wear my boots, my leather jacket (heck even my goose down puffer jacket) and bust out my collection of scarves. I want to feel the cool crisp chill in the air, and the burst of warm air and joyful anticipation of what's waiting for me, as I step into A.P.C., Bird, Jumelle, Curve, Isabel Marant, Mick Margo, J. Crew, Madewell, Bergdorfs or Barneys (I just had to do a run through of my fave Manhattan/Brooklyn haunts, sob!). Strange that it feels absurd to turn the A/C on just to wear a thick coat at home. Guess that's why there is no such thing as a "winter state of mind". those nautical flipflops are cute! :) i wish we had all 4 seasons in manila, it'd be nice to break in the layers. i definitely miss your winter outfit shots! i cant wait to get the girls some cute flip flops. we miss you berry :) and of course you too tin! @Belle - Awww, we miss you girls too! Hope we can visit you soon! @poise - Yes! I am here! And you got it right ION Orchard B2! You have such a photographic memory!